These unscented black taper candles make stunning centerpieces when paired with our spooky Halloween candelabras and candleholders, sold separately. Dripless and smokeless in solid Black for a number of dark themes. 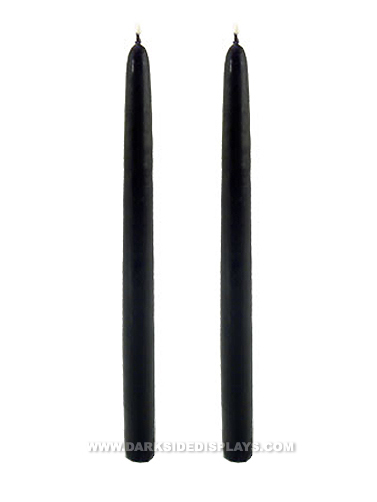 Black Taper candles measure 12" with a burn time of 3-4 hours. Due to the nature of the dipping process involved in making taper candles, base size may vary. A candle shaper and/or wax candle fitters may be necessary to ensure a good fit into a standard holder. Set of two.